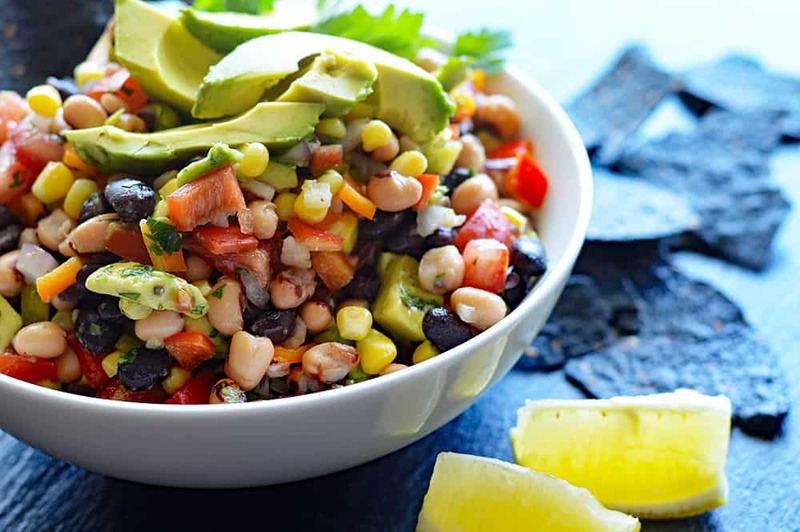 According to Wikipedia, Texas Caviar is defined as “a salad of black-eyed peas lightly pickled in a vinaigrette-style dressing, often eaten as a dip accompaniment to tortilla chips.” I just define it as delicious and hope you enjoy my version of Cowboy Caviar a/k/a “Texas Caviar”. What exactly ARE black-eyed peas? The California Blackeye is pale-colored with a prominent black spot. There are countless varieties, many of them heirloom, that vary in size from the small lady peas to very large ones. 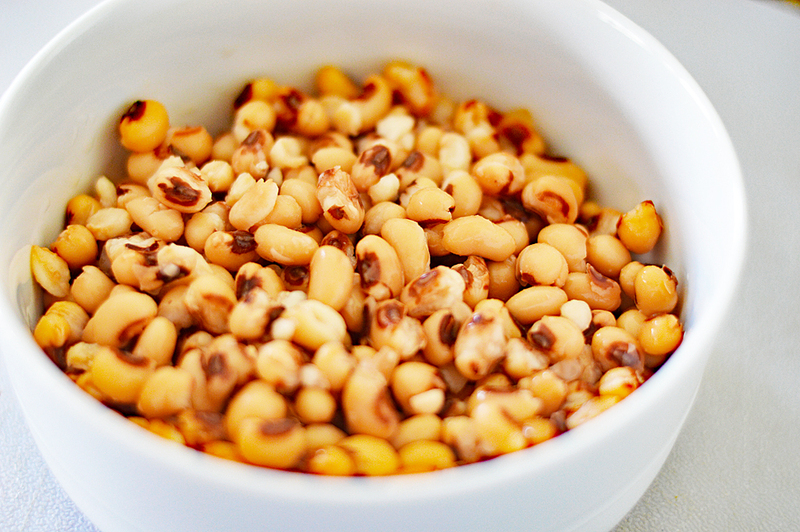 In the South, eating black-eyed peas, or Hoppin’ John, on New Years Day is said to bring prosperity in the New Year! I am going to stick really close to tradition with the base of this historical recipe and was actually able to find the black eyed peas in the canned aisle of my local Safeway grocery store. In 2010, Texas Monthly Magazine published the original recipe for Helen’s Texas Caviar (adapted to fit our recipe) One fifteen-ounce can cooked black-eyed peas (drained and rinsed), 1/8 to 1/4 cup oil, 1/8 to 1/4 cup white wine vinegar, 1 whole garlic clove, 1/8 cup thinly sliced onion, 1/4 teaspoon salt, cracked black pepper, to taste. 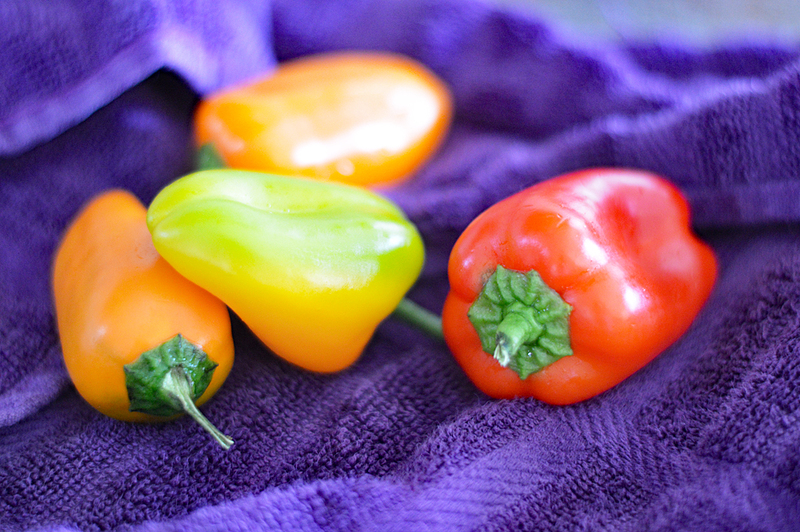 Combine all ingredients, store in a glass jar in the refrigerator and remove the garlic clove after one day. 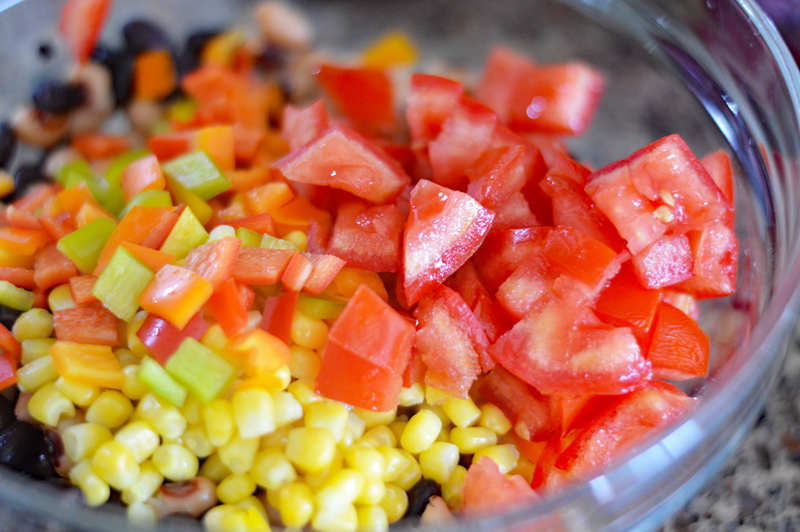 Marinate for at least 2 days before serving in our salad. That was the extent of Helen’s recipe for the black eye peas. 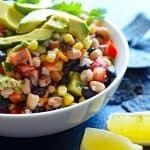 Obviously, it has been recreated many times and in more modern versions with the addition of corn, black beans, peppers, red onion, tomatoes and avocado. So that is the version I decided to go with. I just love the colors in this dip! Red onion and parsley are added along with the tomatoes and corn. I used frozen and defrosted corn, as I always have it on hand. Fresh or canned also work. Last, but certainly not least, avocado. 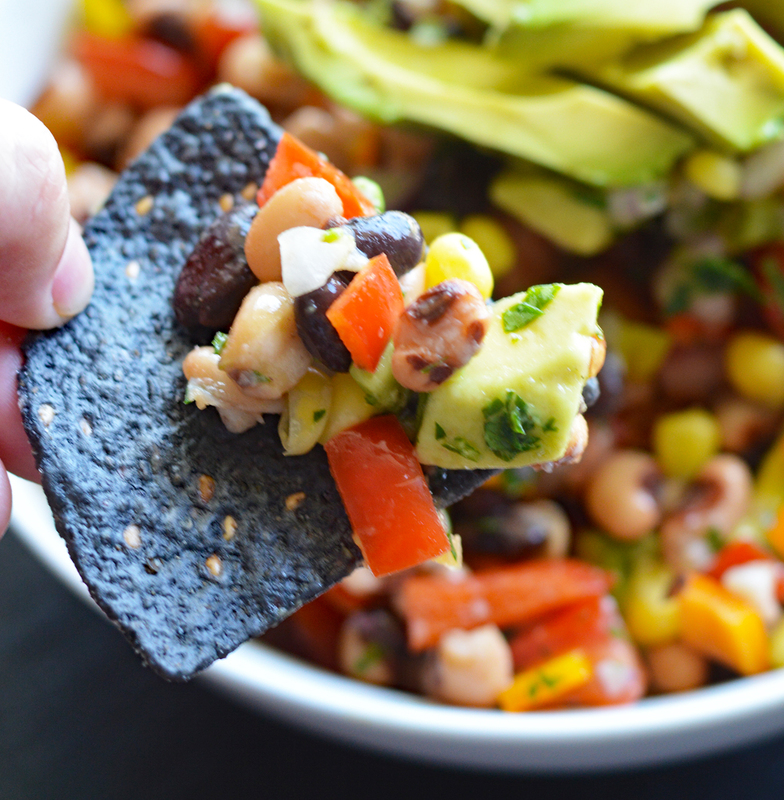 Give everything a good toss, garnish with more avocado and parsley and serve with your favorite tortilla chips. I love these blue corn and flax seed tortilla chips (from Target). 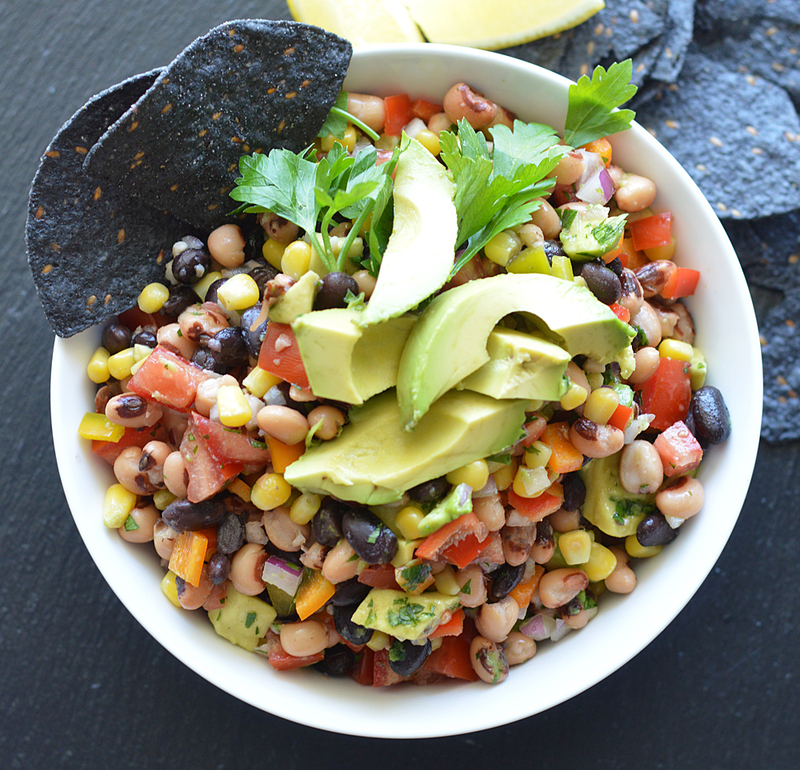 They are the perfect vessel for enjoying this simple, yet amazing Cowboy Caviar dip! I love this recipe because it’s so easy to throw together and guests love it. 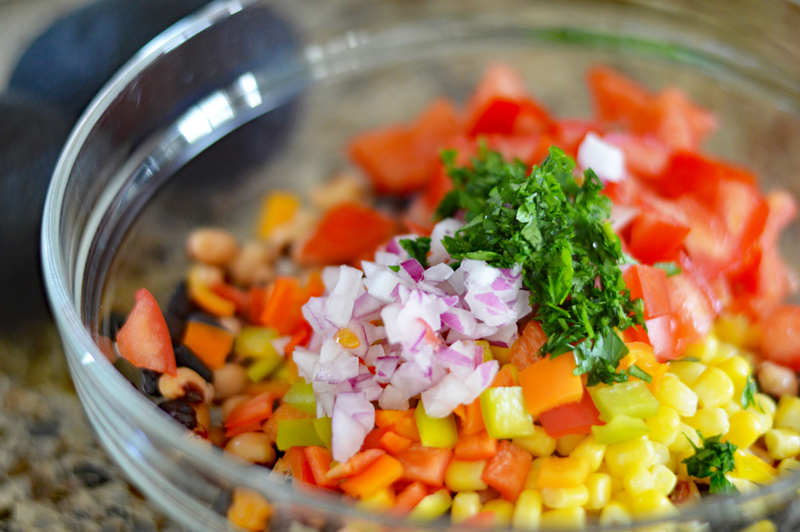 Did you make this recipe for Cowboy Caviar a/k/a “Texas Caviar”? Is this a recipe you create for your friends and family? I’d love to hear what you do differently. Leave a comment below! Cowboy Caviar a/k/a "Texas Caviar"
Marinate the peas for 2 days, discarding the garlic clove after the first day. Drain the black eyed peas and discard the liquid. We just want the peas. Do not rinse. 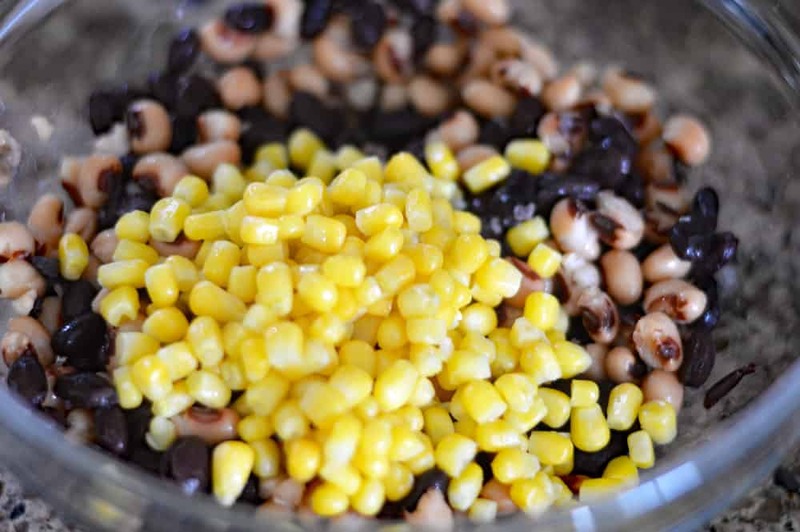 Toss the black eyed peas with the remaining ingredients. Garnish with sliced avocado and fresh parsley. 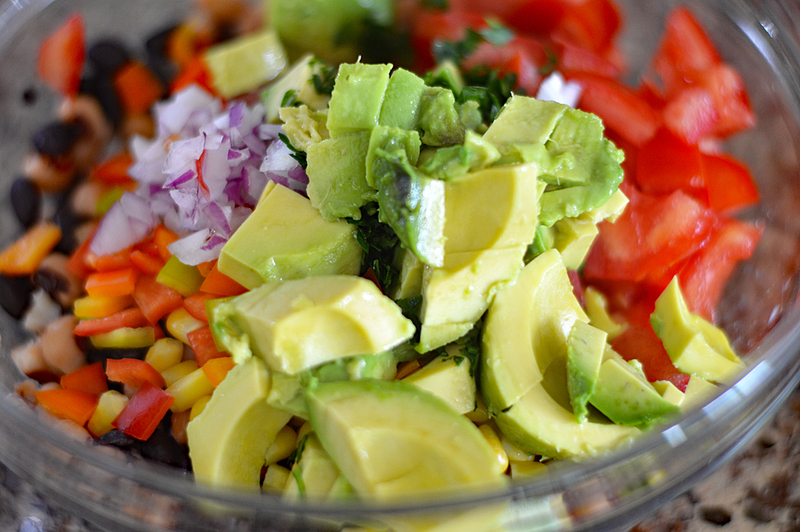 This recipe can be made in advance, just omit the avocados until ready to serve. I made this for a party and LOVED it! Everyone loved it and wanted to take some home. 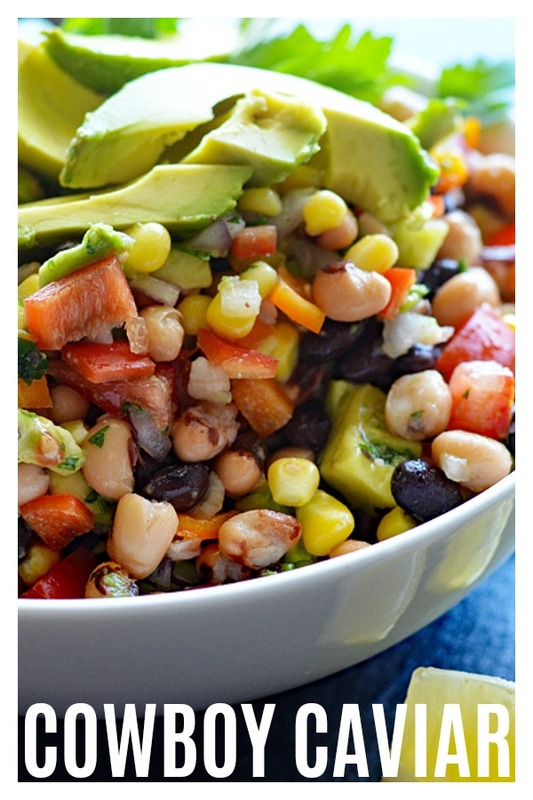 It is great with chips, on a vegi burger, on top of greens for a dinner salad. So simple and so versatile. I subbed cilantro for parsley, but otherwise stayed true to your recipe. Thank you.